Are there any pests that are bothering you? It’s time to call home pest control in Oldham!With us as your pest control company, you will not have to worry about rats or mice ransacking your house during the night. Of course, the moment you notice one, you will find a whole pack of them by the following week. So, how do you protect your house against these disease carrying pests that may ruin your house and your health as well? As experts in this area, we, at Pro-Kill Environmental can provide you with a few tips to ensure they don’t enter your house. In Oldham, home pest control is great for effectively getting rid of the rats and mice and cockroaches in your home which have become out of control. We assisted a client with a pest problem and when we had finished, the client was curious to know how he could avoid the problem in the future. Even though there are no set rules to keep all the pests out of your house, you may consider taking some measures. For instance, rodents and other pests like to feast on food. Before you go to sleep, keep all the food covered and wrapped up, even your pet food. Do not leave any food outside, that will attract pests of all kinds. If you have a hole in your house, fix it as soon as possible, that’s where the pests will come in. So keep them out by fixing that hole. If you do not want termites ruining your good furniture, then make sure to keep piles of wood as far away as possible from the house. If there is an infestation already, then the best course of action would be to call a home pest control in Oldham. We are more than happy to make sure that your house is free from any kinds of pests, rodents and bugs. With more than 25 years in the industry and accredited by the BPCA, we are qualified to exterminate many kinds of harmful pests in and around your house. 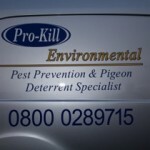 For home pest control, contact Pro-Kill Environmental. This entry was posted in Pest Control and tagged Home Pest Control in Oldham, Oldham Home Pest Control. Bookmark the permalink.